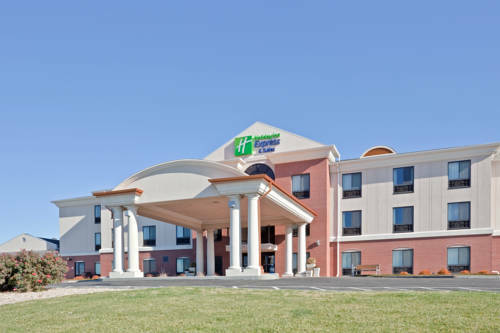 The best property in Concordia, Kansas!Enjoy a plethora of newly renovated amenities at the Holiday Inn Express Concordia, such as our 24-hour business center, pool, hot tub and fitness center with all new equipment. Let the kids swim in the indoor pool while you relax in the whirlpool. Take advantage of our complimentary, hot Express Start breakfast featuring our signature cinnamon rolls, fresh coffee, pancakes, and much more! We are right off of Highway US-81 and are within close proximity of many leisure and corporate destinations, which make us ideal for each type of traveler. Business guests find that we are perfectly suited to meet all of your needs, including complimentary HSIA. Let us house your company event or seminar in our 900 sq. foot meeting room. Alstom, Concordia Tractor Company and Cloud Community College are all just a short drive away. History surrounds us. Take a peek at what life was like for the German POWs in WWII by taking a stroll through Camp Concordia. The National Orphan Train Complex also offers a unique glimpse into American History. If you're not a history buff, why not catch a show at the Brown Grand Theatre or visit us yearly for the Watermelon Festival and Fall Festival? Book your room now and see what makes the Holiday Inn Express Concordia the best lodging option in town. We offer 700 square feet of space to accommodate your meeting and conference needs. Children's program - City Park is located at 11th and Washingtoon Streets and offers basketball courts, tennis courts, a skateboard area and a sand volleyball area. Walmart Supercenter with pharmacy and photo center. The 9-hole "Concordia" course at the Concordia American Legion Golf Course facility in Concordia, Kansas features 2,573 yards of golf from the longest tees for a par of 34 . The course rating is 32.5 and it has a slope rating of 112. Built in 1907 the Brown Grand Theatre has been restored to its original splendor. A variety of shows and concerts are put on at the theater and its unique setting adds to the audiance's appreciation. Call for tour information. Housed in the former Carnegie library the museum has Charlie Blosser's Lincoln-Page airplane, POW camp memorabilia, and many county attractions.